Eighteen VPC members were on hand for our last meeting (held on Thursday October 19), including three newcomers---Armando, Isaac and Tsung-Yen! Many thanks to all who attended, and to Richard for the use of the venue. Justin's SKB (Penton) piston-filling fountain pens. The larger of the two is the F20 model and the one above it is (I believe) the F10. 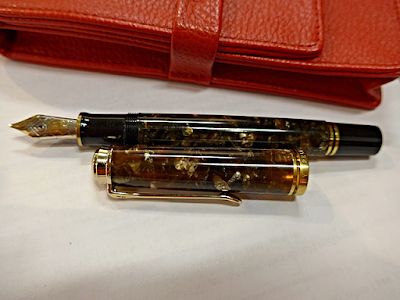 Justin also brought in a Wing Sung 698, another inexpensive piston-filling demonstrator (see-through) fountain pen that's currently quite popular with our club members. The orange tickets in the photo above were for our door prize draws for some great inks by J Herbin and KWZ, donated to our club by Vincent. The J Herbin '1670' inks (two bottles of "Bleu Ocean" and two bottles of "Stormy Grey") were won by Isaac, Lenal, Mindy and Tsung-Yen, and the KWZ Turquoise iron-gall ink was won by Ray. Many thanks again to Vincent for his very generous donations! 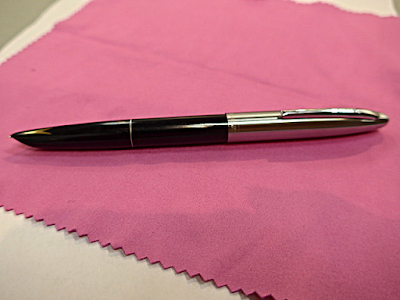 More good fountain pens for beginners! 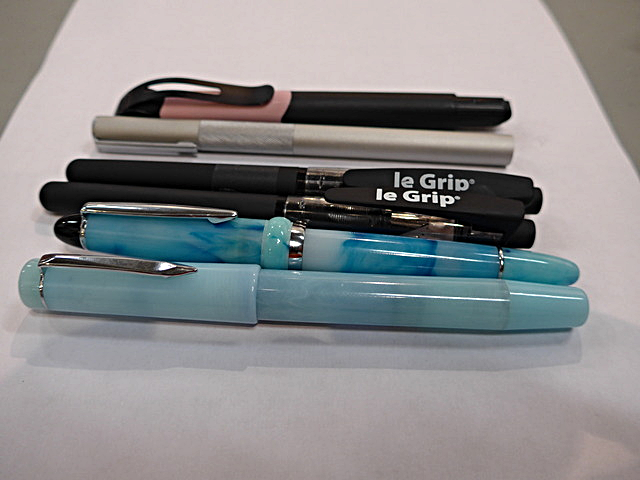 These were brought in by Jerred----(top to bottom): pink/black Online 'Academy', 'Aluminum Round' fountain pen by Muji, two black LeGrip fountain pens, a blue swirl resin/acrylic fountain pen acquired from aliexpress.com, and a CaliArts 'Ego 2' piston-filling fountain pen in pale blue. Mindy's Hero '329' (older version), a Parker '61' knockoff. 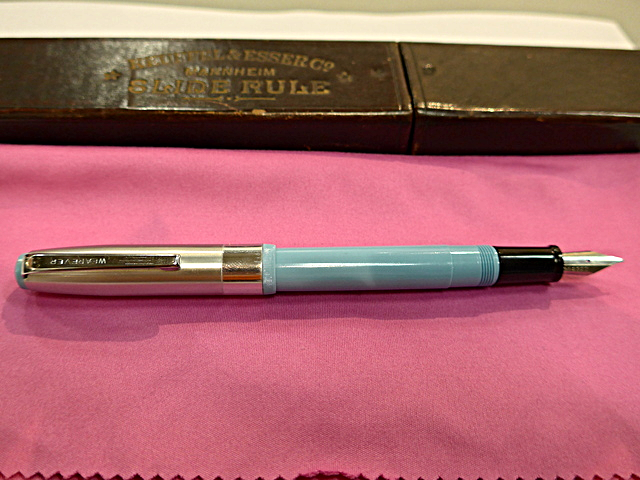 Mindy also brought along her Pilot 'Penmanship' fountain pen (filled with some nice Robert Oster "Opal Mauve" ink) for our topic. 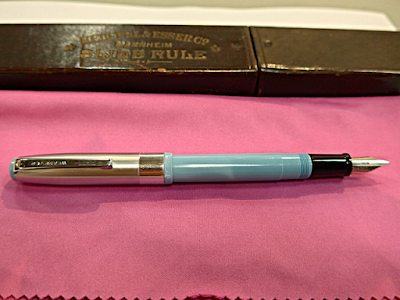 Julienne's cool Pelikan 'Up' fountain pen. 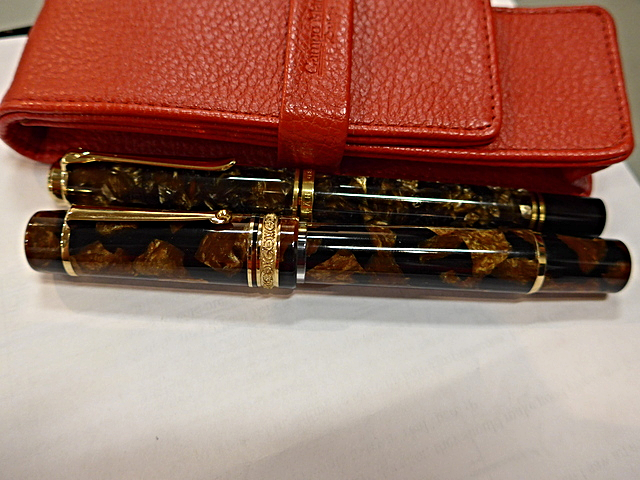 Julienne also brought in two more pens for the meeting theme---a Pelikan 'Twist' and a Parker '45'. Newest Acquisitions is always our secondary theme/topic and here are a couple of newly-acquired vintage items that Stuart brought in to show us---a NOS (New Old Stock) Wearever 'Saber' fountain pen (nice article on it here) and his grandfather's old slide rule. Stuart also brought in a couple of modern fountain pens he recently bought at the Vancouver Pen Shop's annual October sale---a lovely Faber-Castell 'Intuition' and a Lamy '2000' in black Makrolon. A couple of mediocre photos (taken by myself) of a stunning fountain pen---Glenn Marcus' wonderful, handcrafted celluloid fountain pen, the Momento Zero (pen #1/1) made by a new Italian pen company - Leonardo Officina Italiana. You can see much better photos of the pen here on Glenn's own pen blog (link). (photo above) Glenn's new Visconti 'Medici' made of Acrosilk---acrylic resin and silk fibers woven together to create a a unique and beautiful material. Gorgeous! 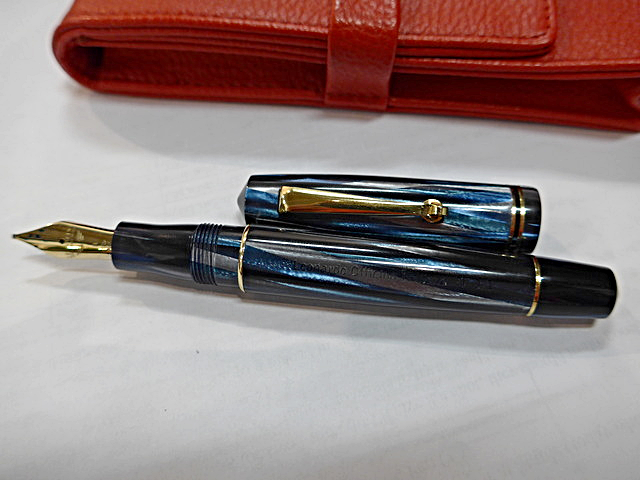 A shot of Glenn's Pelikan (top pen) next to our very own fountain pen, the Delta 'Dolcevita' Caruso Vancouver Pen Club Limited Edition (owned by Julienne). 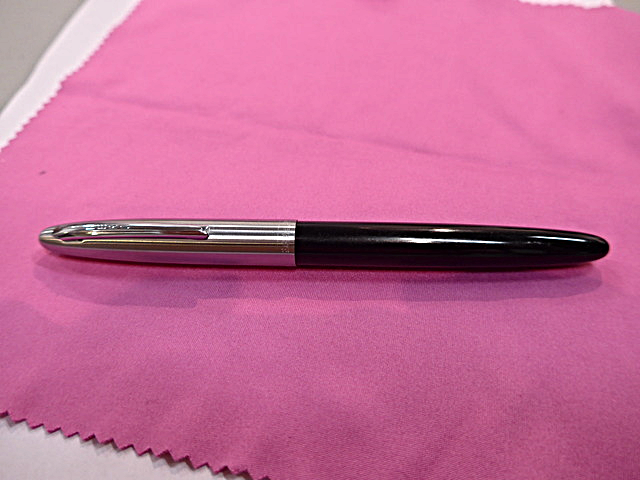 Both lovely pens in their own right! Some more new acquisitions our members brought in for the meeting: Armando's handsome new leather pen case by Franklin-Christoph, Ray's Porsche 'Carrera' fountain pen, Isaac's 'Jaipur' fountain pens (sturdy, affordable piston-fillers made for online seller Fountain Pen Revolution), as well as my own new FPs---my Laban 'Mento' in pumpkinseed, a vintage Parker 'Duofold Jr' and a Bulow '330' I bought from Nick at the Birmingham Pen Company in Pittsburgh (a very good online seller I'd heartily recommend). ---Tony's Platinum 'Riviere' (that his daughter bought him), Bic 'Easy Clic', Pilot 'Kakuno' and Lamy 'ABC'. There's a photo of Tony holding the Bic in its original packaging in this older blog post . 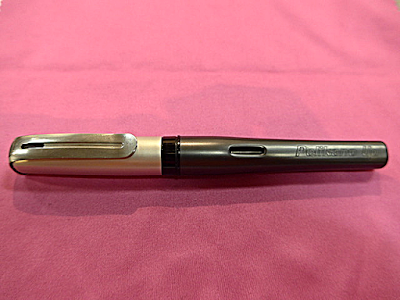 The 'Easy Clic' is a simple little fountain pen, but it has an intriguing way of accessing the cartridge---you "snap open" the barrel, as you would a shotgun! 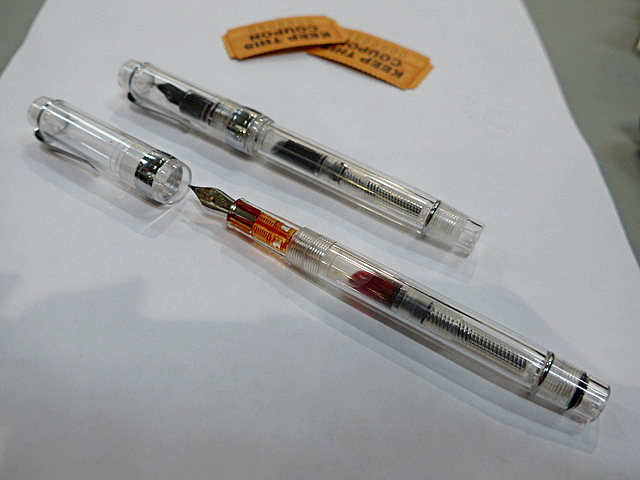 ---Isaac's TWSBI '580' (a great starter fountain pen) and Jinhao 992 fountain pens. ---Maja's (ie. 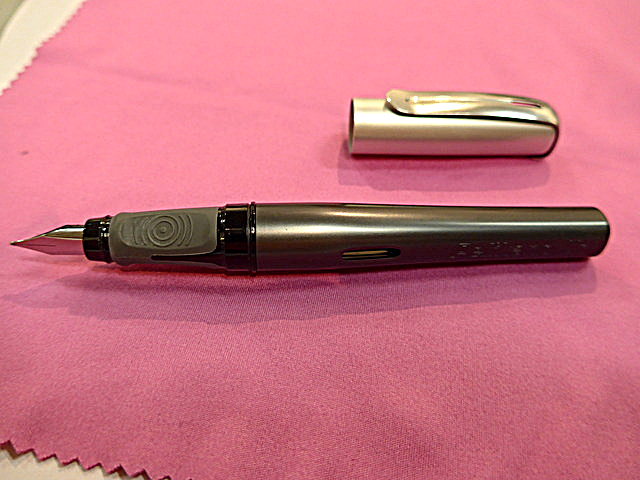 mine) Pilot 'V-Pen' (aka Pilot 'Varsity'), Lamy 'Safari' and Sheaffer '100'. ---Ray's Rotring 'Freeway' and vintage Montblanc 'Carerra' (ca. 1971). 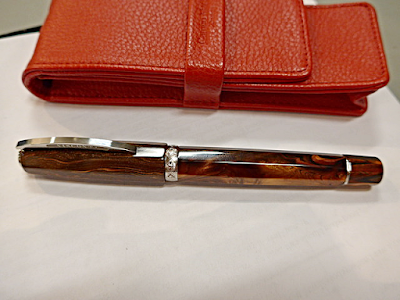 ---Armando's vintage Parker '45' and Parker 'Sonnet'. ---Tsung-Yen's Wing Sung '698' (nib reground by FPNibs.com) and Lamy 'Safari'. ---Lenal didn't bring them to this particular meeting, but she also recommended the 'Safari', as well as the Lamy 'Al-Star'. ---Bruce's Retro 51 'Scriptmaster II' in tortoise, the ever-popular TWSBI '580' and a vintage classic - an Esterbrook 'J' fountain pen. Interestingly enough, resident pen repairman Mark Harcourt also recommended another classic vintage fountain pen for beginners---the beloved Parker '51'. 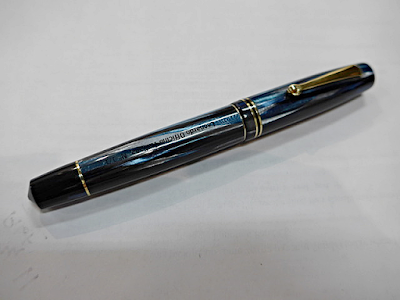 We're hoping to do some presentations (meeting themes) next year featuring several iconic pens (including the Parker '51') when we resume meetings in January 2018. Keep watching this blog for more details on that in the coming weeks. Alternately, you can sign up to receive emails when new blog posts appear here by entering your email address in the "Follow by email" box (located on the far left-hand side of each webpage).